We proudly present our Doggie Cakes Amazon.com store where we join companies such as 1-800 Flowers, Omaha Steaks, Harry and David, Wine.com and many others. We had a soft opening on February 1, 2012. 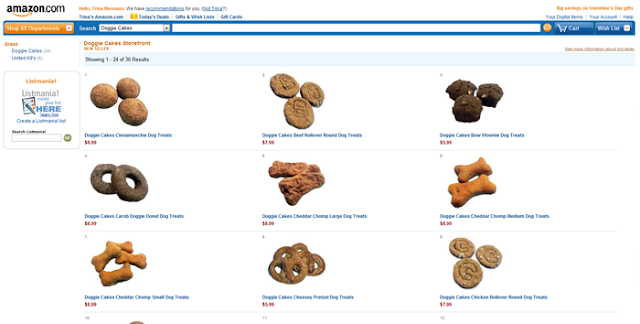 Doggie Cakes was asked by Amazon.com to be a part of it's seller program, where our products would be a part of Amazon.com search results and shopping cart ordering. Amazon.com was very helpful in providing instructions, rules, and ongoing support in the weeks before our launch. They gave us the kick in our pants to upgrade some of our treat photos for the DoggieCakes.com store as well. We started with 24 types of Doggie Cakes dog cookies and a few dog sweaters, but are encouraged by Amazon to grow to hundreds and thousands of products at our desire. If you have other shopping to do, remember you can pick up some Doggie Cakes treats, that best-seller, and any product in the Amazon.com website and we'll bake and ship your treats upon order. It's a great time to use that Amazon gift certificate to buy some fresh-baked Doggie Cakes treats. Exciting times and can't wait to see how we grow with Amazon. Check out our Amazon button on this blogs header bar. It will take you right to our company page.